David Loberg Code has been a Fulbright Scholar and visiting researcher at the University of Oslo in Norway and the Norwegian Network for Technology, Music and Art; and has taught previously at Hobart and William Smith Colleges and at the University of Maryland. Code's undergraduate work was in viola performance and his master's degree and doctorate are in music theory. He has articles in publications including Perspectives of New Music, Computer Music Journal, Interface, Journal of Music Theory Pedagogy, Theory and Practice, Music Theory Online, Studio Musicologica Norvegica. 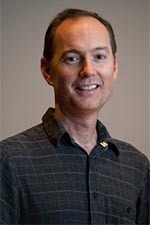 His research interests focus on live interactive performance with computers, alternative tuning and metric systems, and interdisciplinary topics such as music and feminist pedagogy and world music. He is the founder and director of KLOrk, the Kalamazoo Laptop Orchestra and developer of the Groven Piano, a 36-tone interactive piano network which received its premieres in Oslo, Norway and the Gilmore International Keyboard Festival. A violist, Code also specializes in the performance of Norwegian folk music and dance and has taught at the International Workshops in Stavanger, Norway.